It's like a complex lego build on steroids, but with much higher stakes. 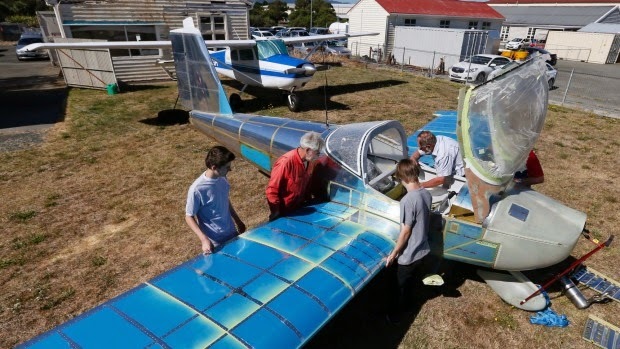 A group of young Nelson students has spent the past two years building a kitset aeroplane. The mission has been a lesson in persistence and patience, and on Saturday the students and their mentors celebrated the milestone moment of attaching the Van's RV12's wings to the craft. Students started when they were at college, toiling to decode the plans and fix the pieces together on Wednesday afternoons and Saturday mornings. The kitset plane was imported from the United States in five wooden boxes by longtime aviator Alan Caudwell, of the The Copter Shop. Caudwell, and his partner Julja Vogt, were in the States a few years back and met students who had put a similar plane together. Struck with how passionate the youngsters were about the project, they decided to import a similar plane to help Nelson students gain insight into aviation engineering. Caudwell bought an RV-12 kit from Van's Aircraft. The project, which started in 2012, was initially run with the different colleges, but Caudwell said that had been frustrating at times. However, a core group of students had stuck with the project, with others joining in along the way. The project was supported by a number of different local business sponsors and mentors from people working in the aviation industry in Nelson also gave up their Saturdays on a regular basis. Retired aviation engineer Mike Cole was also a big part of the project. Two young men who had worked on the plane were now studying aviation through Nelson Marlborough Institute of Technology in Blenheim. Caudwell said the project taught practical engineering skills and plan reading skills that he believed was missing at college. "It surprises the hell out of me that anybody wants anybody that comes from the school. "I've talked to a lot of people and the one thing that seems to be lacking in the schools is the ability for kids to translate technical information and put it into practical use." Those who had come through the programme could hopefully now read plans and not have to have employees standing over them, he said. When the plane was finished the students involved wanted to have a go flying it, and he would sell it. He estimated the plane would sell in the $100,000 range and said it had cost about $130,000 to this point. "To see these guys now with it coming together, they are quite delighted by it. To start with [the project] was a bit of a hard row." Harrison Carver, 19, has been involved since the start. He now has an apprenticeship at Repaircraft. He said the project was fantastic and he had learnt a lot. "I've got a job out of it." He initially wanted to be a pilot, but working on the plane had "got me hooked into engineering. I was interested in everything aviation pretty much". WINTER HAVEN — Leesburg plans to build a $1.2 million seaplane ramp at Leesburg International Airport, which city officials say will be vital for economic development. But Leesburg could get some competition from Winter Haven Municipal Airport, whose director wants to expand seaplane operations there. That man is Leo Treggi, Leesburg’s former airport director. City Manager Deric Feacher said he hired Treggi last November based on his knowledge and skill set “to expand the airport’s economic opportunities.” Treggi said he has big dreams when it comes to seaplanes and said Winter Haven is perfectly positioned to grow into the role of a seaplane capital. He said one thing he wants to do is organize a seaplane gathering, maybe one called the International Seaplane Festival & Parade. The event would be held in November and would involve some kind of big-lake-only competition between seaplane pilots. Treggi said he wants Bryce’s Juvenile Diabetes Foundation as a partner. The nonprofit organization serves families with children affected by Type 1 diabetes. Winter Haven’s airport is in an unusual, if not unique, situation: It’s surrounded by six lakes. From 1,000 feet in the air, the airport “looks like an aircraft carrier,” said Jon Brown, who has operated Jack Brown’s Seaplane Base on Lake Jessie next to the airport since 1963. “There is a whole lot of synergy that we can trade off of from the success of our (Tavares) neighbor and bring that success next door to our airport, and one of the things that we need to do for that is build the seaplane ramp,” Minner said. Leesburg is still rounding up grant money for the ramp project. According to the website iflightplanner.com, there are more than 40 seaplane bases in Florida but only three are public, including the ones in Tavares and Winter Haven. 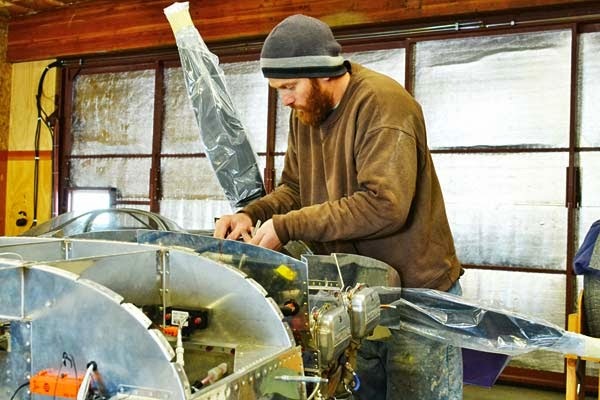 Peter Dixon figures he has about 500 hours of work left before his Van’s RV-7 airplane is ready to fly. After two years of not really knowing what his airplane would look like, Peter Dixon’s Van’s RV-7 is finally becoming recognizable. “It’s only looked like an airplane for about the last two months,” he said. Putting the fiberglass nose cone onto the fixed-pitch catto propeller three weeks ago was the most recent landmark event in Dixon’s labor of love. “Right now it seems like I’m doing about a thousand things at once,” Dixon said. Within the last few weeks he has also finished the wiring and the instrument panel and started installing the engine baffles. The in-wing fuel tanks were the hardest things to build, he said. The next big milestone will be when the RV-7 is finished, about five to seven months from now, he estimates. “It’s so hard to tell how much more time before I finish. It will take as long as it takes,” Dixon said. Building this airplane has been Dixon’s full-time job for the last two winters. On winter days he can be found working on it from 9 a.m.-5 p.m. daily in the hangar he rents from Don and Pat Owens at the Twisp airport. During the summer, the 32-year-old Methow Valley native works in construction and gets in a few hours of work on the plane when he can, he said. Dixon remembers being out in his parents’ large vegetable garden as a child, and watching Stan Gardner fly over in a tiny ultralight. “I thought it was pretty cool, but looked way too dangerous,” he said. He started flying around age 14 with Ed Matthews out of Chelan. “Ed was kind of a fly-by-the-seat-of-his-pants kind of guy. I did the book work on my own,” he said. The youngster hitchhiked or got his parents to drive him to Chelan for lessons, which he took whenever he had spare money from odd jobs. “I saved up money and flew whenever I could, a few hours here and there,” he said. Dixon got his solo license at age 16, before he had his driver’s license. He had to wait until he was 17 before he could get his private pilot’s license and take a passenger along with him. Since then, countless hours of drilling and de-burring holes, riveting, polishing and putting pieces together have made Dixon pretty adept at this process by now. Building a plane from a kit gives him the advantage of getting some parts pre-cut and pre-bent; however, other components Dixon has had to build himself. Another advantage of building his own plane will be the ability to do his own maintenance on it and save money in the process, he said. This is actually the second RV-7 Dixon has built. He built the same airplane in 2005 but never flew it because he couldn’t afford to put an engine in it at the time, he said. He sold it to a man from California in 2007, who came to Twisp and “handed me a big stack of money,” Dixon said. The Van’s RV-7 is the best design for performance and resale, Dixon said. “You can actually build it and make money on it.” A high-demand airplane, once it’s finished it could sell for around $75,000, Dixon estimates. “Buying this plane already built would be more than I can afford,” he said. By the time he’s done, he will have put about $45,000 and 2,000 hours of work into it, he figures. But cost and resale value aren’t the only factors in Dixon’s decision to build this airplane. It’s also the best-designed plane for general use, he said. The RV-7 cruises at 200 miles per hour, using about 7 gallons of gas per hour — about 30 miles per gallon. The plane is nimble, fully aerobatic, able to do loops, rolls and spins, Dixon said. And “it’s built for travel. It’s the best of all worlds,” he said. Dixon plans to use his RV-7 for camping and visiting friends who live far away. He figures it will get him to San Diego in about 12 hours. “I’ll fly it as long as I can afford it,” he said. He plans to invite friends and family out for a launch party after he’s flown it a few hours, he said. It will take about 40 hours of flight testing before the airplane can be certified and he can take a passenger up in it. In the mean time, Dixon figures he has about 500 more hours of work before first takeoff. He must document each step of the building process for the eventual FAA certification. The RV-7 will be certified as an Experimental Amateur-built Aircraft. Best of all, even after it’s sold to somebody else, Dixon’s name will still be on the plane. “I will always be the manufacturer of this airplane,” he said. The National Park Service is extending its application deadline for dive companies that want to take tourists on an underwater trip to see a B-29 Super­fortress at the bottom of Lake Mead. The original deadline was Friday, but officials at Lake Mead National Recreation Area decided to extend it until Feb. 20 after just one company applied. Park spokeswoman Christie Vanover said the extension also gives the park a chance to clarify an application process that might have been confusing to prospective tour operators. Park officials do not expect the later deadline to change the overall schedule for the enterprise. They still hope to review the applications and issue commercial dive permits by mid-March or early April and see the first tours of the sunken bomber by this summer. “That is still a goal of ours,” Vanover said. The B-29 crashed in the lake’s Overton Arm on July 21, 1948, during a mission to test a secret ballistic missile guidance system. All five crew members survived, but the bomber was lost until August 2001, when a team of local divers discovered it sitting upright and mostly intact on the lake bottom. In 2003, archaeologists from the Park Service’s Submerged Resources Center documented the wreck. Five years later, the Park Service awarded one-year permits to two companies — one from Lake Havasu City, Ariz., and the other from Ventura, Calif. — for guided technical dives at the site, then at a depth of roughly 160 feet. Those first two permits were not renewed in 2009 because the companies struggled to turn a profit on the expensive, technical dives. The Park Service is now offering what it hopes is a more enticing deal: a two-year, commercial-use permit allowing up to 100 divers a year at the B-29 wreck and unlimited scuba instruction and charter dives to other “submerged resources” in the Lake Mead National Recreation Area. The Park Service won’t give the bomber’s precise location or depth because the site is considered a “protected resource,” but a diver familiar with the wreckage said it now rests beneath roughly 110 feet of water. Permit applications for B-29 tour operators are available at www.nps.gov/lake/parknews/b-29-permit.htm. Passengers are being delayed or evacuated Sunday afternoon due to two, possibly three bomb threats being investigated Sunday afternoon at Seattle-Tacoma International Airport. Passengers aboard JetBlue Flight 1006, which landed at 4:15 p.m. were evacuated due to a “security concern” after the plane arrived from Long Beach, airport officials say. Baggage was on the pavement being inspected using dogs, a passenger tweeted. The aircraft was sent to the far southwest end of the airfield, about 2,500 feet from other coming and going flights, said Perry Cooper, spokesman for the Port of Seattle. Passengers were walking off on portable stairs, he said. They were taken to the terminal on buses. A woman named Tiffany has been tweeting pictures of airport police, luggage and the sunset, as she waited for a ride back to the terminal. The evacuation was a precaution, and other jets continued to take off and land, Cooper said. Then another plane was detained, a Delta flight from Phoenix, reported KING 5 News. The pilot mentioned three bomb threats, said Jenna Luthman, an executive producer at Northwest Cable News, who was on board and spoke live to KING 5 during its 5 p.m. newscast. Luthman said the threats are being described as “low credibility,” but that it’s unusual to have three at the same time. “Everyone seems kind of lighthearted,” she said on the newscast. During the JetBlue evacuation, which lasted about 45 minutes, Cooper said there were no immediate reports of injuries, or reports of arrests. A similar incident occurred Sept. 11, when a plane was sent to the far end of the Sea-Tac property, Cooper said. NORTH ADAMS, Mass. – The Airport Commission tabled the approval of Phase 2 apron plans until the full board could meet. Gale Associates, the commission's engineers, provided alternatives on Thursday for the next step in the project. The commission, however, was hesitant to vote because it did not have a full board and had not yet heard if the city can cover the 5 percent local share needed for the project to be funded. "I'd rather table this and call a special meeting next week when I know all of the members will be available and when the mayor may have an answer," Chairman Jeffrey Naughton. Representatives from Gale recommended alternative 2, which includes full reconstructing the apron and the fixed-base operator building. Because there is no extension to the apron, which is included in alternative 1, the city would not have to pay for fixed-rate surveys and additional soil work. Many other aspects of the project can be changed to reduce local contribution but these cannot. If proper funding could not be found the project would only be delayed. The third option called for reconstruction of the apron and partial construction of the fixed-base operator building. Gale representatives said the taxiway may have to be shut down during construction to avoid construction vehicles driving over the newly placed apron, but Airport Manager William Greenwald said this would not be an issue. Alternative 2 would also decrease the amount of tie-down spaces by 30 percent. This would bring the 24 spots down to 15. Greenwald said it should not be an issue, but he would be worried about transient planes that need to tie down temporarily. "You look at the airport at any time, the number varies from eight or nine maybe 10," Greenwald said. "It fluctuates depending on the season. What I do worry about, we do get a lot of transient flights that come in that would want to tie down." The commission discussed possibly adding two more spots near an apron exit and taxi planes out differently. Greenwald also reported that he would like to remove a derelict plane from the airport. He said the owner never signed a contract, but has been paying dues on the tie down. He said he has been having a hard time contacting the owner. "So what they are doing right now, it is very clear, is playing us," he said. "They don't believe that we will have enough spine to pursue this so they are letting this piece of junk sit there, and it is a danger to the airport." Greenwald said the airport's regulations allows the commission to remove derelict planes if need be. He said there are two sources willing to remove the plane and use it as collateral. If the owner does not pay for the removal, he or she would lose the plane. One of the interested movers wants to purchase the plane and restore it. Commissioner James Neville asked if they could move the plane somewhere else on the airport grounds and charge the owner for daily storage, much like what happens when a car is towed. Greenwald said he would be afraid of any liability if the plane was damaged during the moving process. The regulations have been reviewed by the city solicitor, however, Naughton suggested running the commission's plans by him again to make sure they are acting correctly. "The last thing we want to do is get the city in a legal battle," he said. "I want to make sure we are on firm ground here." Greenwald also told the commission that although the Department of Public Works is plowing the airport in a very timely manner, it is doing it in a way that damages lights. The plows are being adjacent to the edges of the runway and that is breaking lights. He said he felt uncomfortable asking them to change how they do it because they are so busy. "The city is short staffed, and they have a gun to their head trying to get anything done," he said. "Do we sit here and be frankly grateful it is being done in a timely manner or … try to improve the quality of the job?" Naughton suggested the Greenwald continue to show gratitude but he should just inform the DPW of the lights because it is a cost to the city. The Airport Commission delayed a vote on the next phase of the apron project until it could confirm the city's contribution. A Florida woman suspected of drowning a puppy in the bathroom at the Central Nebraska Regional Airport has been booked into the Hall County Jail on animal abuse charges. Grand Island police Sgt. Stan Steele said it appeared the woman may have drowned the two-week-old Doberman puppy after she was denied access to a flight because of the dog’s young age and lack of being properly contained. Cynthia V. Anderson, 56, of Edgewater, Fla. first tried to board a flight at the Grand Island airport on Thursday, but was denied because she had three young puppies, all believed to be two weeks old or less, Steele said. Anderson also was traveling with two small dogs, but the dogs were of age and had proper kennels to board the flight, he said. Anderson’s parents came from western Nebraska and took two puppies, so Anderson again tried to board a flight on Friday, Steele said. She still had the two small dogs and one puppy, which she attempted to conceal in carry-on luggage. After Anderson was denied boarding a flight Friday, she was seen entering a bathroom in the airport’s passenger terminal. Anderson then left the bathroom and another patron reported finding a dead puppy in the toilet. Steele said the Central Nebraska Humane Society retrieved the dead puppy and conducted an autopsy. “The cause of death was determined to be drowning,” Steele said. Anderson was arrested on animal abuse charges and booked into the Hall County Jail. Sunday evening, local fire crews responded to an emergency landing at North Central West Virginia Airport. A regional jet from United Airlines was flying from Dulles International Airport, just outside of Washington, DC, to Dayton, Ohio. During the flight, one of the plane's engines failed and wouldn't restart. Pilots got in contact with air traffic control, who advised them to perform an emergency landing in Bridgeport. A total of 49 adults and one child were aboard the plane, and luckily no one was hurt. Passengers we talked to described what they saw and heard. "All of a sudden, (I heard) a big loud boom, and then another one, and there was lots of vibration, and we were all kind of looking around, like 'What's happening? ', and looking for flames or whatever else. It was quite scary," said Becky Brown, a passenger from Dayton, Ohio, who was on the flight. Pilots landed the plane quickly, even though at the time of the engine failure, the plane was at quite a high altitude. "I just heard someone here say that they had a father who was monitoring at home, and said he told her how high we really were and said that they did a great job of lowering us very rapidly. We couldn't notice that. We were watching out the window but you couldn't feel how fast we were coming down," said Patricia Kuhlman, a fellow passenger also from Dayton, Ohio. After they landed, passengers were quick to praise the flight crew for their work in making sure no tragic events occurred. "The flight attendant was very good because she said right away, 'We are going to make an emergency landing, and just be calm. I'll be through to collect trash,'" added Brown. Officials at the airport say that they see about two to three emergency landings every year. Last year, country singer Miranda Lambert's plane landed at the airport after an emergency. Luckily, no one was hurt in that incident either. Both passengers 5 News talked to said that they fly a lot for their jobs, and that this incident isn't going to keep them away from the runway any time soon. BRIDGEPORT, W.Va. — An airplane headed to Dayton Sunday evening made an emergency landing. The United Airlines regional jet, with 49 adults and one child aboard, apparently lost oil pressure and had to land early after departing from Dulles International Airport in Washington, D.C., according to a report by CBS affiliate WDTV in West Virginia. The plane landed just after 6 p.m. at the North Central West Virginia Airport in Bridgeport, W. Va. The plane was headed to Dayton, the TV station reported. During the flight, one of the jet’s engine’s failed and wouldn’t restart. Pilots were advised by air traffic control to perform an emergency landing in Bridgeport, according to WDTV. “All of a sudden, (I heard) a big loud boom, and then another one, and there was lots of vibration, and we were all kind of looking around, like ‘What’s happening?’ and looking for flames or whatever else. It was quite scary,” said Becky Brown, a passenger from Dayton who was on the flight. Pilots landed the plane quickly, despite the plane’s high altitude at the time of the engine failure. “I just heard someone here say that they had a father who was monitoring at home, and said he told her how high we really were and said that they did a great job of lowering us very rapidly. We couldn’t notice that. We were watching out the window but you couldn’t feel how fast we were coming down,” said Patricia Kuhlman, a fellow passenger also from Dayton. “The flight attendant was very good because she said right away, ‘We are going to make an emergency landing, and just be calm. I’ll be through to collect trash,’” added Brown. Officials at the airport say that they see about two to three emergency landings every year. Last year, country singer Miranda Lambert’s plane landed at the airport after an emergency. Luckily, no one was hurt in that incident either. Both passengers from Dayton who spoke to WDTV said they fly a lot for their jobs, and that this incident isn’t going to keep them away from the runway any time soon. BRIDGEPORT — A plane bound for Dayton, Ohio, had to make an emergency landing Sunday at North Central West Virginia Airport after experiencing engine trouble, Airport Director Rick Rock said. The ERJ 145 United Express aircraft was transporting 53 passengers from Washington Dulles International Airport in Virginia when it had to land on North Central West Virginia Airport’s runway at approximately 6 p.m., Rock said. There were no injuries, and the landing went smoothly and without incident, Rock said. The passengers were to wait for another plane to finish their trip, but instead they will be bussed to their destination, Rock said. “All mutual aid assignments responded to the airport and did an excellent job,” Rock said. Also responding were the Bridgeport, Nutter Fort, Stonewood, Anmoore and and Flemington fire departments, and airport emergency vehicles. Want to fly 1,000 chickens facing the ax in California to a refuge farm in upstate New York? Feel like taking your family on an eight-week trip around the world on a multimillion-dollar executive jet? Or does your organization need to fly medical workers to Liberia to help control the Ebola outbreak? Philip Mathews, president of Fort Lauderdale-based Air Partner Inc., can help you out. In fact, Air Partner handled all of these situations. Mathews heads the U.S operations of a firm that arranges flights to anywhere in the world for executives, wealthy individuals, groups and freight. “If anyone or anything needs to move around the globe, that’s what we do,” said Mathews, who took over as president of Air Partner’s U.S. operations here in 2003. “We’re like an insurance broker for aviation,” said Mathews, who graduated from the University of Buckingham in England where he studied economics and law. Always interested in aviation, he found a summer job as a check-in agent at London’s Gatwick Airport soon after graduation. Air Partner Inc., a wholly owned subsidiary of U.K.-based Air Partner Plc, is an air charter broker. It does not own or operate any planes and is not an air carrier. It provides charter aviation services to individuals, companies and governments and moves specialized freight, especially time-sensitive items. The company arranges flights on executive jets or turboprops for 1-19 passengers, commercial jets for 20 passengers and up, as well as cargo jets. Late last year, for example, Air Partner shipped a 46-ton mechanical dragon from the city where it was made in France to Beijing in an enormous, Russian-made Antonov 124 cargo jet. “We work with charter operators and commercial airlines and can arrange flights on any type of aircraft, from a King Air 200 to a Boeing 777, and everything in between,” said Mathews, whose summer job at Gatwick turned into positions as a flight dispatcher and general operations manager at the airport, before he accepted an executive position at FlighTime, a U.S. air charter broker. He later joined Air Partner. When a client contacts Air Partner, the company looks for the best logistical options — cost, type of aircraft, availability, range, location — and books a flight. Air Partner receives a commission for its service. Its U.S. operations usually generate revenue of about $60 million a year. Air Partner Plc, the U.S. unit’s publicly traded parent company, was founded in the U.K. in 1961 to train pilots, and evolved into one of the world’s leading providers of aviation charter services. Air Partner Inc. opened its offices in Fort Lauderdale 17 years ago and now has a staff of 16 working next to Fort Lauderdale-Hollywood International Airport. The company uses its local sales staff to find new business, but relies heavily on word-of-mouth references. In addition to the regional headquarters in Fort Lauderdale, Air Partner has offices and representatives in New York City, Washington, D.C., Boston, Houston and Boise, Idaho. Parent Air Partner Plc has a worldwide workforce of around 200 with offices in Europe, Asia and the Middle East. Fort Lauderdale is an excellent strategic location for Air Partner’s U.S. headquarters, Mathews said. Clients on most of the flights in and out of Fort Lauderdale-Hollywood International Airport arranged by Air Partner are high net-worth individuals, corporate executives and government agencies using executive aircraft. The company typically arranges 20-30 flights each month out of South Florida, but will not identify any of its clients. Flying on an executive jet is not cheap. Mathews’ staff said that a one-way flight from Fort Lauderdale to Caracas on a Gulfstream IV for two people would cost $50,000 (meal included), while the same flight (also with a meal) on a somewhat smaller executive jet (a Hawker Siddeley 800XP) would cost $35,000. Aside from arranging flights for chickens (which were about to be slaughtered before they were rescued by a poultry-friendly farmer), wealthy individuals and families and medical staff traveling to danger zones, Air Partner in Fort Lauderdale handles a variety of other cases. It flew many European and local soccer fans to the World Cup in Brazil and back, and made arrangements to charter commercial jets that picked up about 2,000 people from a damaged cruise ship in Ketchikan, Alaska. Mathews recently received a call to assist a group of people who were stranded in Barbados when their plane experienced mechanical problems. He immediately arranged for a flight from England (their starting point) to Barbados, where the passengers were picked up and taken back to England. For Air Partner, unexpected situations often crop up in the middle of the night and require immediate attention. “We tend to concentrate on complex business situations,” Mathews said. Business: Fort Lauderdale-based Air Partner Inc., a wholly owned subsidiary of the U.K.’s Air Partner Plc, is an air charter brokerage company. Air Partner is not a carrier and does not own or operate any aircraft but acts a broker, linking up customers with flights on private executive jets, commercial aircraft and jet freighters year round, all over the world. The company puts its clients and freight on chartered aircraft ranging from small executive jets and turboprops to commercial jets (like the Boeing 777-200) and the giant, Russian-made six-engine Antonov 124. It also handles emergency operations. The parent company, Air Partner Plc, has 20 offices across Europe, North America, the Middle East and Asia. U.S. headquarters: 1100 Lee Wagener Blvd., Fort Lauderdale, set up 17 years ago. Other offices and representatives in the United States: New York City, Washington, D.C., Houston, Boston and Boise, Idaho. Management: Philip Mathews, president for the United States unit, which covers operations throughout the Americas. Founded: Air Partner Plc was founded in the U.K in 1961 as a school for training pilots. Employees: 16 in Fort Lauderdale; about 200 worldwide. Revenues: About $60 million a year from U.S. operations (Air Partner Inc.). Ownership: Air Partner Plc is publicly traded (London Stock Exchange). SAN DIEGO – The identities of the two Camp Pendleton Marines killed in a helicopter crash in Twentynine Palms were released Sunday. Capt. Elizabeth Kealey, 32, and 25-year-old 1st Lt. Adam Satterfield were the only two people aboard 3rd Marine Aircraft Wing UH-1Y Huey helicopter when it crashed at 4:40 p.m. Friday, according to MCAS Miramar officials. They were in a training drill near Twentynine Palms. Both Kealey of Indiana, Penn. and Satterfield, of Oldham, Ky. died in the crash. 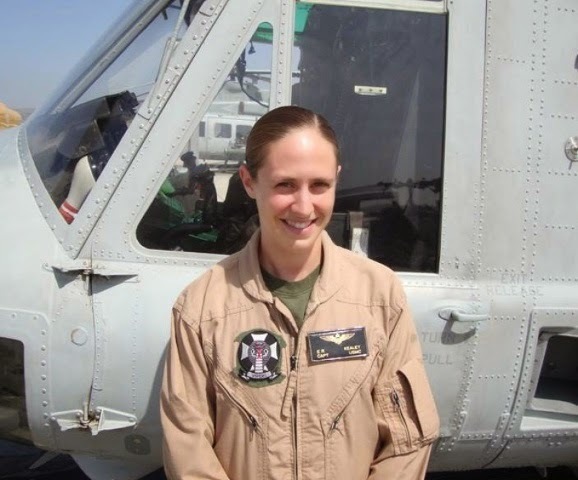 Kealey had been in the Marine Corps since May 2005 and served as a helicopter pilot and weapons training instructor. She had been deployed twice with the 13th Marine Expeditionary Unit and once in support of Operation Enduring Freedom in Afghanistan. Her personal awards include the Air Medal with three Strike/Flight awards and the Navy and Marine Corps Achievement Medal with gold star in lieu of second award. 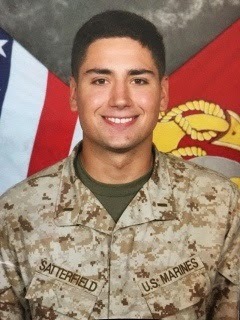 Satterfield was commissioned in the Marine Corps in June 2011. He served within HMLA-169 as a UH-1Y helicopter pilot and supported Marine Air-Ground Task Force training operations in the Southern California area. The cause of the incident is under investigation by military authorities. SAN DIEGO — Imagine, for just a moment, you’re Rick Garza. It’s right after the terrorist attacks of Sept. 11, 2001, and no one wants to fly. The airline industry has been practically grounded — and so are your hopes of ever working in it as a pilot. You still send out applications, knowing the competition is stiff among a growing pool of qualified, out-of-work pilots. But you also know that at some point, potential employers are going to look into your background and find out: You were the flight instructor who trained, and then flunked out, two of the 9/11 hijackers. Nawaf Alhazmi at San Diego’s Montgomery Field are memorialized in The New York Times, in books and in Google searches, his encounters with the terrorists helping form the historic narrative leading to the pair’s final destination: the Pentagon. Instead, Garza credits his connection to the attackers — and his conviction to flunk both of them out of flight training — to divine intervention. “I remember just being on my hands and knees and thanking (God) for helping me make that right decision,” Garza said. Neither of his former students were ultimately able to obtain pilot’s licenses and ended up as two of the four muscle men aboard American Airlines Flight 77, threatening the crew and passengers with box cutters and knives, while another terrorist, Hani Hanjour, flew the Boeing into the Pentagon. All 64 people aboard the aircraft, including the hijackers, were killed, as well as 125 victims on the ground. Life as we know it changed for all Americans after that, some more than others. The attacks derailed Garza’s shot at becoming an airline pilot, and haunted him with nightmares. But the bad dreams have since faded, and his flying career is far from over. “I found out they were skydivers,” he remembered. He read up on the sport and, in a burst of childhood enthusiasm, goaded his friend into riding their bikes some 20 miles to get a closer look. They came home after dark, exhausted, dehydrated and in trouble with his mom. But Garza was hooked. “I knew that was something I wanted to get involved with at an early age,” he said. It wasn’t until his 30s, after working several years in Navy shipyards, that Garza decided to pursue his passion. He said the ink was practically still wet on his commercial pilot’s license when he applied at the skydiving place from his boyhood. He flew on weekends and days off for Parachutes Over San Diego, dropping jumpers out of a modified Cessna 182. (He also learned to skydive. He’s got 24 jumps under his belt.) When the company closed about three years later, he decided to teach flying full time. In his early-40s by then, Garza quickly became a popular instructor at Montgomery Field in Kearny Mesa. “I loved aviation and I loved teaching people. That was a natural,” he explained. In May 2000, he’d take on his most infamous clients. The flight instruction of al-Midhar and Alhazmi was set into motion with a phone call from the Middle East. The Saudi men had the funds to pay and the desire to learn, and Sorbi’s Flying Club told them to come on over. These weren’t Garza’s first foreign students. He was used to teaching would-be pilots from all over — Japan, France, Italy, Canada, Germany — who came to the United States because the cost of instruction was more affordable. He was also used to navigating language barriers. However, it was clear early on that these guys would be a challenge. An instructor at another local flight school had already turned down one of the men after a lesson because of his poor English. To Garza, Al-Midhar looked a bit sinister with what appeared to be a knife scar across one cheek. “He was very quiet, he had those wandering eyes, always looking around,” Garza said. Alhazmi understood English better and ended up doing most of the talking. At their first lesson, Garza told the men to read the first three chapters of their flight textbook before their next meeting. It was apparent by that next meeting that they hadn’t. They couldn’t repeat back, much less remember, the French word for the rear components of an airplane. “Did you read chapters one through three? How far did you get?” Garza asked. On their introductory flight, as they neared landing, al-Midhar began praying aloud in the back seat, not stopping until they’d touched down. ”He wouldn’t give me an answer, just kind of shook his head,” Garza remembered. Garza explained they were going to have trouble expressing themselves if they continued training. Without missing a beat, they pointed to a twin-engine plane parked nearby, and asked if they could learn to fly it. Then they pointed to a larger plane — a King Air — then a jet. 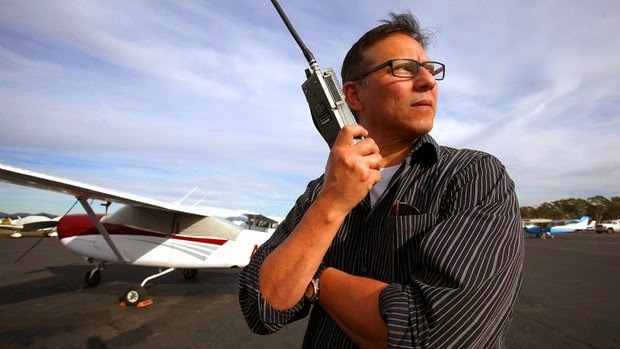 “You have to learn in this first,” Garza stressed, pointing to the small Cessna 172. Vexed, Garza told them he’d give them one more shot. He instructed them to go home and learn the alpha-bravo-charlie alphabet used by pilots so they could make taxi calls to the tower. They didn’t. The next flight, the men couldn’t grasp simple radio communications, nor did they possess the mechanical aptitude for basic flight operations — straight-and-level flight, left and right turns. As they took notes during one lecture, al-Midhar drew the wings on the plane wrong, making them sweep forward rather than back. “It was like ‘Dumb and Dumber,’” Garza said. Garza was at a crossroads with his two Saudi students. They clearly couldn’t understand English well or grasp flight basics. But it was also early in the training, and they had the money to spend. Many other flight instructors might have kept them on, Garza said. Teaching is a starving industry. If someone will pay, you don’t turn them down. Garza knew he had to do what was right. The pair went to another nearby flight school, which turned them down upon hearing Garza had dropped them. Garza saw them once more. They returned days later to pay him for that last lesson, the one in which he flunked them. A year and a half later, Garza was at home when his best friend called. “Turn the news on. There are airplanes flying into the Twin Towers,” he urged. “The first thing I saw was the Twin Towers, smoke billowing out, and the second plane hitting the second tower,” Garza remembers. The Pentagon crash wasn’t far behind. He drove to the airfield, and by then the name “al-Qaeda” began floating around on the news. The owner of the flying club, Fred Sorbi, had heard the hijackers were Saudi. “I told Rick, ‘Go get the file on those two guys,’” Sorbi, now 65, remembered. It was still dark the next morning when Garza was awakened by loud banging. “Mr. Garza, this is the FBI. You’re not under arrest. We’d just like to talk to you,” came a shout outside. The agents showed Garza a photo lineup, and he immediately picked out his former students, although they were identified by different names. The agents then pulled out a notebook, and it contained al-Midhar’s drawing of the backward wings. Garza also learned that the Lemon Grove home of a prominent Muslim leader where his students had stayed was just blocks away from his own home. The media soon learned about the connection between the hijackers and Montgomery Field. By the time Garza drove over, the place was swarming with reporters from around the world. He quietly removed his business cards and name placard from the desk in an effort to keep a low profile, and sought advice from a criminal defense lawyer who was one of his students. But he couldn’t stay out of the spotlight long. He agreed to a few interviews — The New York Times was important, he felt — and his story of his time with the terrorists went global. Just before 9/11, Garza went to a job fair for SkyWest, the small commuter airline many of his friends had gone to. He was ready make the career leap. Then the skies went quiet. The effects the attacks had on air travel were devastating even years after. He still went to his formal interview with SkyWest soon after the attacks, but he was all of the sudden competing with furloughed pilots from the major airlines for fewer slots. He wasn’t hired. He applied for several jobs after that, but would stay away from the commuter airlines that included questions about ever being under investigation or affiliating with known terrorists. 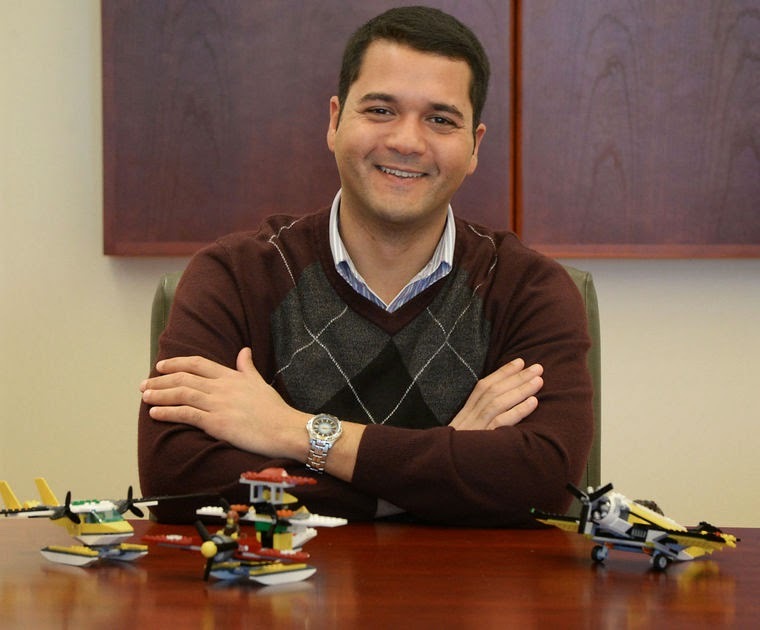 Garza found his niche around 2004, flying air ambulances. He currently pilots a Cessna 421 for Desert Air Ambulance, commuting to its base in Blythe and answering radio calls to ship patients to and from hospitals around Southern California, Arizona and Nevada. He only works 10 days a month, giving him time to pursue his other passion of serving on the leadership team of the Rock Church’s campus in El Cajon. He also still teaches flying on the side. He’s even had some Middle Eastern students, but only ones whose backgrounds he knows. Like most Americans nowadays, Garza dutifully follows new travel rules put into place following 9/11 and other terrorist plots — padding through airport security in socks, removing liquids from carry-ons. But he also is realistic about the myriad new tactics being dreamed up by those who want to hurt our nation. Still, it gives him some solace knowing that al-Qaeda had two less pilots on 9/11, and therefore maybe fewer planes. On January 25, 2015, about 1100 mountain standard time, a Cessna 172F airplane, N8368U, impacted terrain in the Routt National Forest, Colorado. The private pilot was seriously injured and the airplane was substantially damaged. The airplane was registered to and operated by a private individual under the provisions of 14 Code of Federal Regulations Part 91 as a personal flight. Visual meteorological conditions prevailed and no flight plan was filed for the cross country flight. The airplane impacted sparely wooded, mountainous terrain at an approximate elevation of 10,000 feet. Both wings were crushed and impact damaged. The fuselage was crushed and distorted. The empennage separated from the aft cabin but remain attached to the airplane via control cables. The right elevator was crushed. The airplane has been retained for further examination. At 1115, an automated weather reporting facility at the Steamboat Springs Airport (KSBS), located 16 nautical miles to the northwest of the accident site, reported wind from 080 degrees at 4 knots, visibility 10 miles, an overcast ceiling at 2,500 feet above ground level, temperature 32° Fahrenheit (F), dew point 23° F, and altimeter setting of 30.40 inches of mercury. 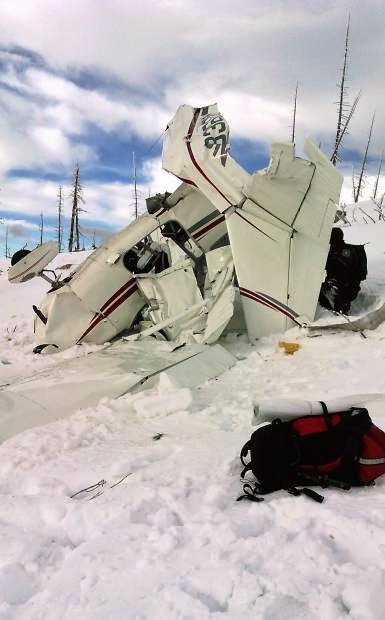 The pilot who crashed his single-engine airplane near Rabbit Ears Pass on Sunday survived by calling his family and 9-1-1 shortly after the crash, starting a fire and waiting for rescuers, who arrived at the remote scene less than four hours after the accident. The crash occurred just after 11 a.m. Sunday, Jan. 25, approximately 6 miles south-southwest of Rabbit Ears Pass just over the Grand County line in Routt County, said Grand County Search and Rescue public information officer Greg Foley. Eleven members of GCSAR, an equal number from Routt County Search and Rescue and members of Grand County EMS responded to the scene. Mark Darling of Eaton was en route from Baggs, Wyo., to Loveland when the crash occurred, Foley said. It is not clear whether he had landed in Steamboat Springs, he added. The cause of the crash is under investigation. Darling was the sole occupant of the plane, and he managed to get himself out of the tangled wreckage and start a fire after calling for help, Foley said. He said there were low clouds in the area at the time of the crash and temperatures were in the mid-30s Sunday afternoon on top of Rabbit Ears Pass. The plane is a single-engine, high-wing Cessna. The injured pilot was extracted from the crash site in a sled pulled by snowmobile for eight miles back to the staging area at the Muddy Pass Trailhead on US Highway 40 and loaded onto a Classic Air Medical helicopter for transport to a Front Range hospital, Foley said. According to the Steamboat Pilot, Darling is a former Steamboat Springs resident. The newspaper reported Monday morning that he was in fair condition at Denver Health Center. “We could get pretty close to the guy on one of those groomed trails up there,” he said. Three people died in another small plane crash near this crash site in July 2003, according to a Steamboat Pilot article. The wreckage of that plane was airlifted out of the Sarvis Creek Wilderness, according to the newspaper. Foley said this crash was close to but not in the wilderness area. The location poses problems for searchers not only because of deep snow and challenging terrain, but also because of its location near the sinuous county line, which can cause jurisdictional issues. Routt and Grand counties have an agreement about responding to incidents in the area, he said, because Routt authorities generally can get there in about half the time. In this case, it was a Routt County-led operation with the crash site in Routt County but the staging area in Grand County, Foley said. 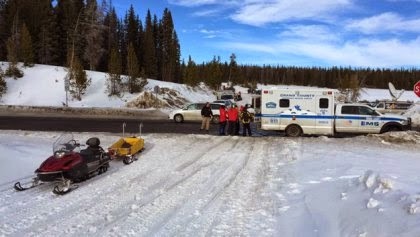 Members of Grand County Search and Rescue, Routt County Search and Rescue and Grand County EMS extract the victim of a small plane crash via snowmobile near Rabbit Ears Pass on Sunday and take him to a waiting ambulance. He was then placed aboard a medical helicopter and transported to a Front Range hospital. His injuries were not thought to be life-threatening. ROUTT COUNTY, Colo. (CBS4) – A pilot is lucky to be alive after crashing the plane he was flying in a remote part of a high country forest. The crash happened south of Highway 40 on the east side of Rabbit Ears Pass Sunday morning. According to Grand County Director of Emergency Management Ray Jennings, the pilot, identified as Mark Darling from Eaton, contacted a family member by phone after the plane crashed and said he was badly injured. 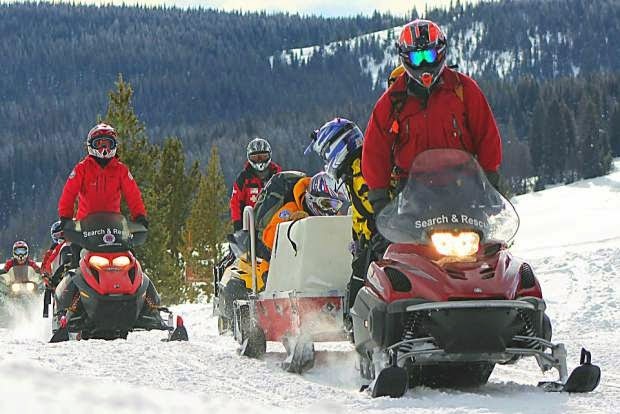 More than 20 search and rescue personnel on 18 snowmobiles entered the Routt Forest. Darling complained of several injuries but none appeared to be life threatening. He was the only person on board the plane. “They did check him out at that point and he was in great shape; a little cold. They were able to put him on a snowmobile and bring him to the end of the road,” Livingston said. By the time the pilot was brought back to the search and rescue command center he was in pain and very cold. He had built a fire to stay warm waiting for rescue. “We didn’t really have any idea of the condition he was in until they got there, but just assuming it’s a plane crash we always expect the worst,” Livingston said. Darling was then put back in the air again and transported by helicopter to a hospital in the Front Range. Darling reportedly told some of the first responders that he had survived a previous crash. Rescuers told CBS4 the crash was an area they call the Triangle where there have been several crashes over the past few years. The most recent was in August in which the pilot and a passenger were both killed. Steamboat Springs — A single-engine airplane crashed at just after 11 a.m. Sunday south of the summit of Rabbit Ears Pass, according to Routt County Search and Rescue president and incident commander Chad Bowdre. The Routt County Sheriff's Office identified the pilot as Mark Darling, of Eaton. He was the only person on board the plane, and according to Bowdre, Darling was in fair condition after being transported by helicopter to Denver Health Center. Darling is a former Steamboat Springs resident and his ex-wife still lives in the Steamboat area. The Cessna 172F high-wing airplane crashed on the top of Green Creek between Sarvis Creek and Harrison Creek, two drainages south of Rabbit Ears Pass. Darling was able to use his cellphone to report the crash, and other planes in the area also picked up signals from the Cessna’s emergency locator transmitter, Bowdre said. Eight members of Routt County Search and Rescue rode snowmobiles into the remote crash site to rescue Darling, who was able to get himself out of the airplane wreckage and start a fire to keep warm before help arrived. Both Grand County and Routt County Search and Rescues and Sheriff’s Offices responded to the report of the downed plane, and a command center was established in the Muddy Pass parking lot off of U.S. Highway 40. At 3:20 p.m., Darling was located and assessed for transport, Bowdre said. A helicopter from Classic Air Medical also flew to the scene to assist. Darling had taken off from Baggs, Wyoming, and was headed to the Front Range via Steamboat Springs when he crashed. According to Bowdre, the pilot houses his plane in Greeley. The cause of the plane crash is under investigation.